“Donate your body to science — volunteer at the Houston Museum of Natural Science!” Or so the tagline goes. Apparently, some volunteers have interpreted the phrase quite literally, and a number of volunteers have spent many years, if not decades, as HMNS volunteers. HMNS currently has 610 active volunteers at all three of our campuses — Hermann Park, Sugar Land and the George Observatory. Collectively, volunteers gave 41,783 hours of service in 2015. That’s a lot of hours! Volunteers contribute to the museum in a variety of ways. 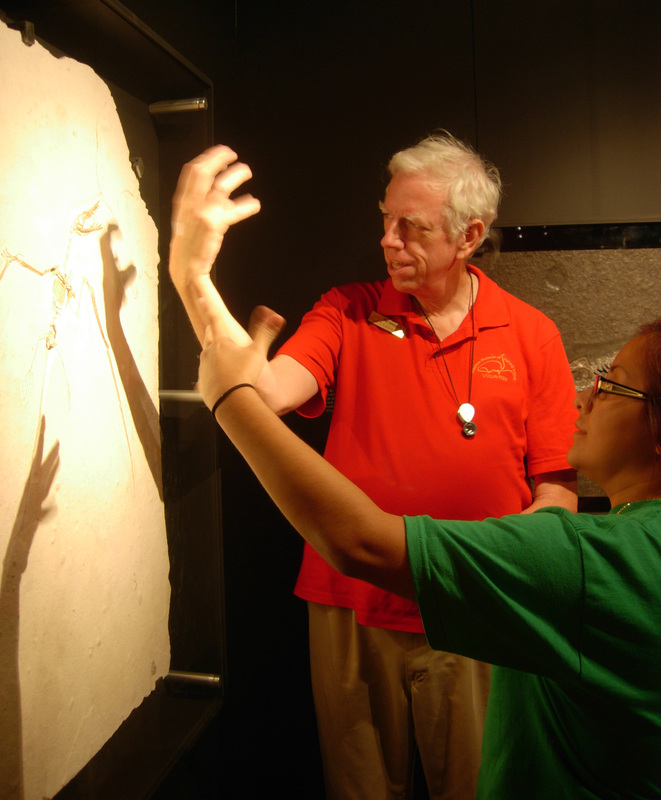 Although the vast majority are docents who interact with and educate visitors of all ages about the museum’s exhibits and items on display, others work behind the scenes with the museum staff, and a very select few, with special knowledge or expertise, work directly with museum curators. Sandy Wilkens began volunteering at the museum during the 1982-1983 school year, when her daughter was in second grade. With a degree in education and a teaching certification, she found a niche at the inception of the Early Investigations program, a science education program for younger children. She recalls sitting on the floor around a teepee, telling inquisitive K-2 students about life on the Plains. Sandy likes to use everyday things to give kids a sense of perspective. For example, she points out that a child’s foot is about the same length as a T. rex tooth! Sandy and her family donated a corn snake named Houdini to the museum. An escape artist like his namesake, Houdini was known for vanishing from his tank. Helpful hint: To capture an escaped snake in a classroom, set up a small, sealed container full of mice (i.e., dinner) on the floor. Chances are you will find the snake wrapped around the container within the next day or two! Most recently, Sandy has coordinated the annual staff appreciation luncheon, given by volunteers to thank museum staff for their support. Mary Briscoe preparing for a Guild luncheon. 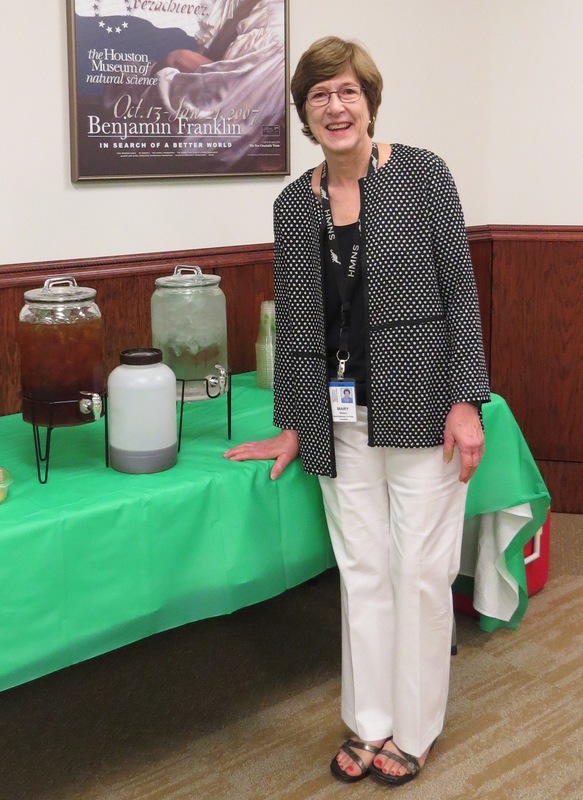 Mary Brisco, a retired pharmacist, became a volunteer in 1987 to further her interest in science. Over the years, she has volunteered in almost all of the permanent exhibit halls, although she admits that the Cullen Hall of Gems and Minerals is a personal favorite. Mary likes to tell visitors about the mesolite with fluorapophyllite specimen. Extremely fragile, it traveled by air from India on a first-class ticket, packed in powdered soap for protection! 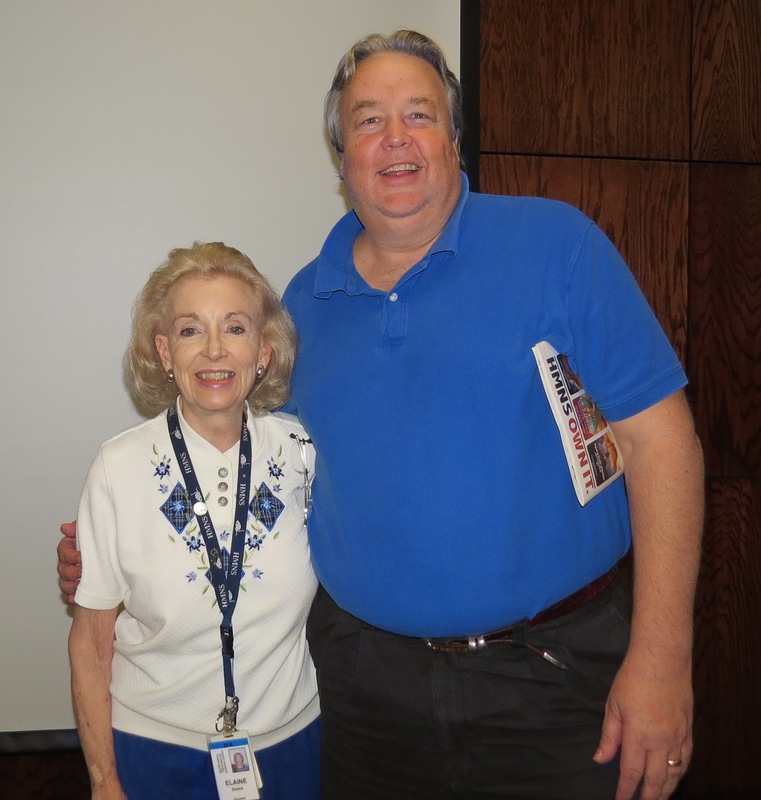 Mary has served in many roles in the Volunteer Guild, including a term as Guild President. Mary’s most memorable museum experience was winning a raffle for a gold-and-diamond necklace and earring set at one of the Galas! Nowadays, Mary is enjoying a change of pace, working in the Cockrell Butterfly Center’s greenhouse on the seventh floor of the parking garage. Elaine Swank with HMNS President Joel Bartsch. Elaine Swank came to HMNS in September 1988, when HMNS President Joel Bartsch was a museum security guard! They became friends, and she remembers when he returned to HMNS as Curator of Gems and Minerals. Elaine especially enjoys school tours, and she continues to work regularly with Houston fourth graders through the HISD/HMNS Program. Although she has experience in all the permanent halls, she usually takes the kids to the Hall of the Americas, where she tells them what to do if they discover an archaeological artifact, and then brings them to the Morian Hall of Paleontology. She always reminds the kids to look up, to see the Quetzalcoatlus from Big Bend National Park in Texas flying overhead! Elaine is well known for carrying an artificial rose, to keep her school groups together. Inda and Neal Immega are well known to frequent museum visitors. Inda and Neal are both geology Ph.D.s who worked in the oil and gas industry. Inda, a mineralogist, began consistently volunteering around 1996. She spends much of her time in Gems and Minerals, but also enjoys the challenges posed by special exhibits — here today and gone tomorrow. She claims she could easily spend a lifetime among the exquisite pieces in Fabergé: From a Snowflake to an Iceberg. 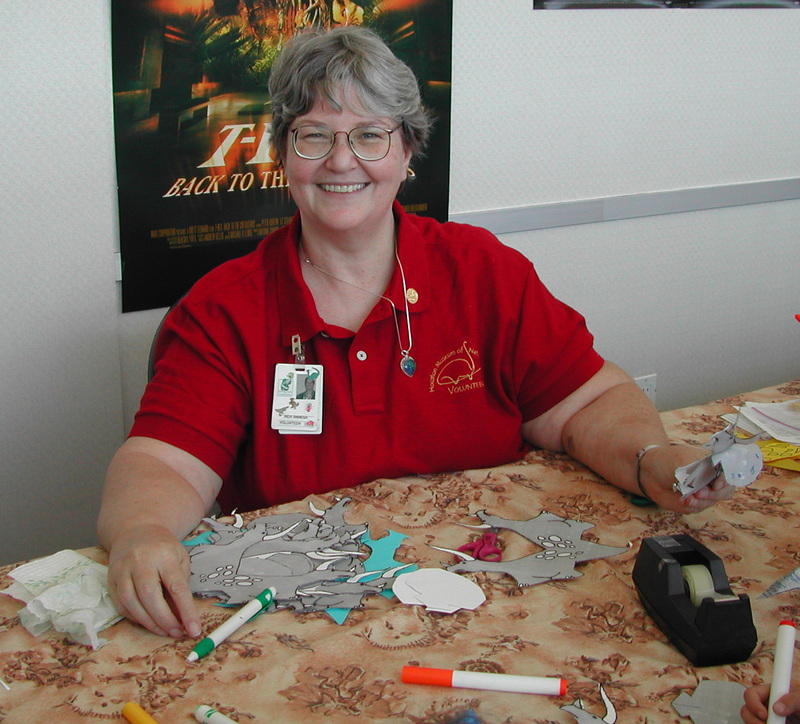 Inda is popular with families and young visitors — she organizes and assembles kids’ crafts and activities for Members’ Nights and other special events. Her most memorable question was when an adult visitor asked about Titanic: The Artifact Exhibition: “Is the real ship in there?” Uhh, no, check the bottom of the North Atlantic … Of course, Inda takes all questions seriously and responded politely! Docent training with Neal Immega. Neal became a regular volunteer after retiring from Shell Oil in 1999. A paleontologist by training, he was thrilled to return to the world of paleontology. Neal says simply, “Paleo has always been my home.” He conducts tours, trains other museum docents, and provides specimens and repairs for the touch carts in Paleo, the Wiess Energy Hall, and for special exhibits like Amber Secrets: Feathers from the Age of Dinosaurs. Neal also works on special projects in paleontology. He curated the Zuhl petrified wood collection, which entailed working closely with Mr. Zuhl; has written labels for some special exhibits; and helps out with “orphan exhibits,” such as repairing and maintaining the steam engine on the lower level. Neal excels in artifact reproduction (fondly called “Nealifacts”), and he is particularly proud of the copper chisel and Egyptian-style wooden hammer he produced for one of the touch carts in the Hall of Ancient Egypt. The Immegas both came to the museum at the urging of Irene Offeman, who was then the Curator of Paleontology. She said the museum needed more volunteers with formal geological and paleontological backgrounds, and the rest is history! Both Inda and Neal have joined HMNS and Curator of Paleontology Dr. Robert T. “Bob” Bakker at the museum’s Permian excavations in Seymour, Texas, and Inda recalls going on a “Dipsy the Diplodocus” trip to visit the original dinosaur quarry in Wyoming. They also got a close-up peek at the scaly skin of Leonardo, a Brachylophosaurus dinosaur mummy. Malacology volunteers, from left: Barbara McClintock, Associate Curator of Malacology Tina Petway, Lucy Clampit, Jim Lacey, and Rachel Zelko. The intrepid team of malacology volunteers deserves special mention. They have convened regularly for as long as most museum staff can remember! In fact, two malacology volunteers, Barbara McClintock and Jim Lacey, preceded the arrival of Associate Curator of Malacology Tina Petway! Barbara, a retired biology teacher, has been involved with HMNS for 64 years. When her children were small, she drove them up from Baytown to attend museum programs. When she retired from teaching in 1995 or 1996, her daughter Margaret (also a volunteer) told her to investigate volunteer opportunities at the museum. Barbara found a home in malacology and has never worked anywhere else — although she admits to a secret fondness for Gems and Minerals, too. Jim, a retired geology Ph.D., originally wanted to work on paleontological specimens. When he was told there were no paleo openings available, he switched to malacology and has remained there since 1998. Colonel Currie’s Epitonium — see if you can find it in Cabinet of Curiosities! Tina Petway came to the museum as a volunteer under former Curator John Wise, who relied on her shell identifications; Tina has a photographic memory for shells. A former schoolteacher, Tina has been a member of the Houston Conchology Society since age 12. Tina recruited the newest members of the malacology team: Lucy Clampit, a retired librarian and longtime member of the Houston Conchology Society, in 2005, and Rachel Zelko, the “baby” of the group who joined in 2015. 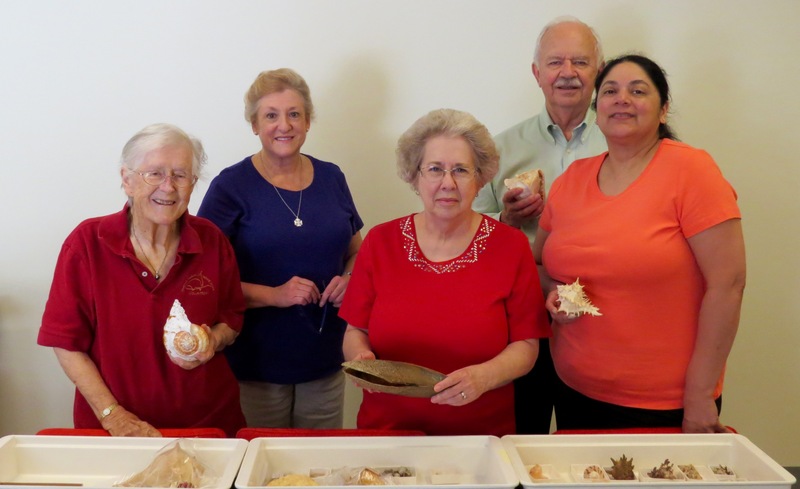 While they don’t interact directly with the public, and work “behind the scenes” at the museum’s collections facility, the malacology group has established close personal relationships based on their shared love of shells and good food! The group meets every Thursday, and usually more often. Rachel, for example, often comes in three or four times a week. They work on new collections—checking the data on incoming specimens, cataloging specimens, verifying identifications and the like. They have been very busy lately. Over the past several years, more than 20,000 specimens were added to the scientific malacology collection — a collection that is worldwide in scope and becoming one of the best in the world by reputation. An exciting discovery in one of the new collections included some shells collected by Colonel Edward Currie, who died in the Battle of Waterloo in 1815 — along with their original handwritten labels! 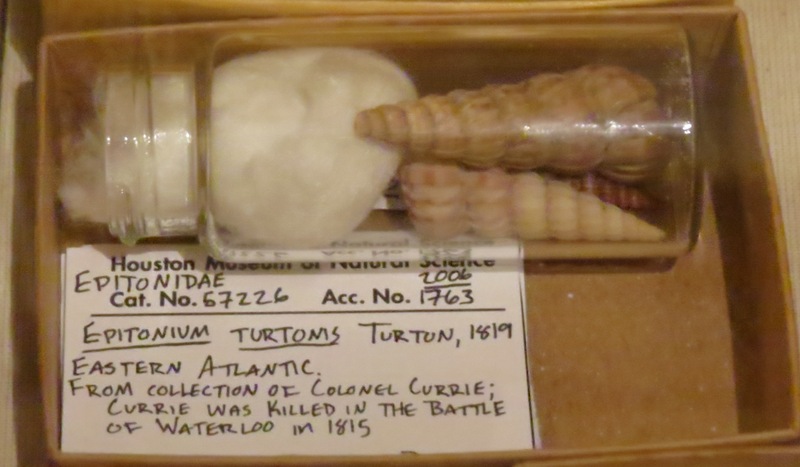 These Epitonium shells are now on view in the museum’s Cabinet of Curiosities exhibit. 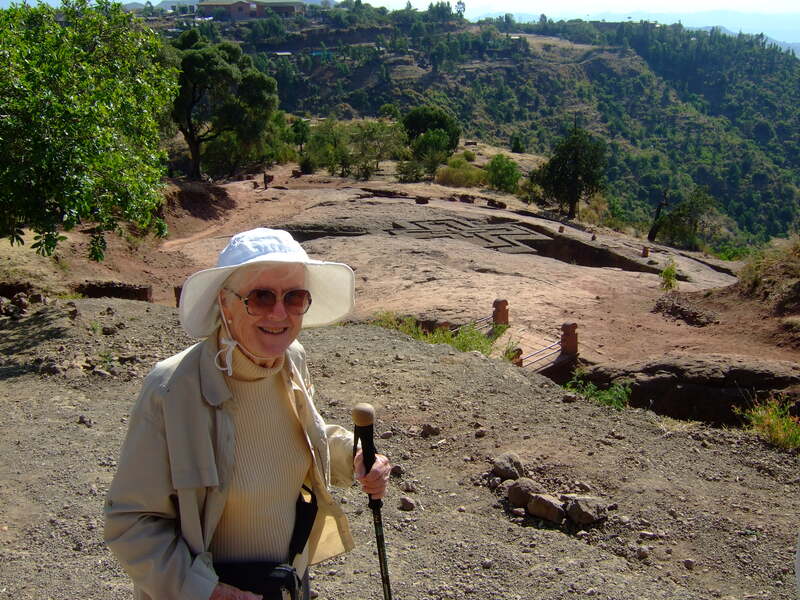 Malacology volunteer Barbara McClintock on the HMNS trip to Ethiopia. 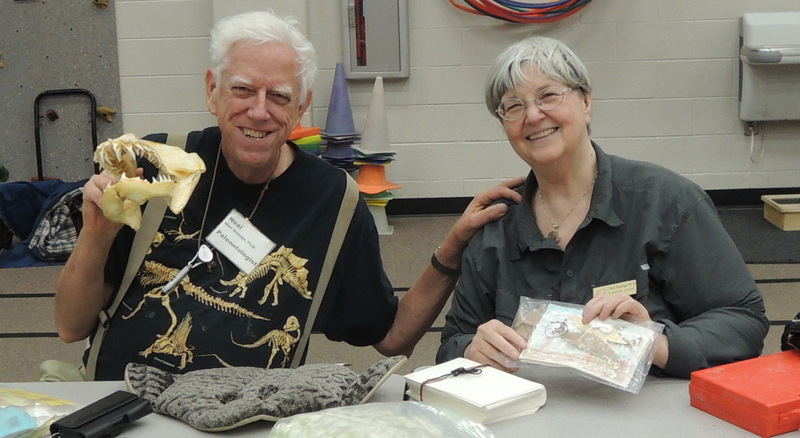 Astute readers may have noticed that volunteering at HMNS is often a “family affair,” and there are many families who volunteer together — husband and wife (like Inda and Neal), parents and young adult/adult children, even grandparents and grandchildren. For example, Julie Swank, a summer volunteer on break from Baylor University, took photos of her grandmother and interviewed her for this blog! Barbara McClintock has several family members who have joined her at HMNS — son John McClintock, daughter Margaret Slutz, and daughter-in-law Susan Peterson. Second-generation docents Jody Vaughan and Peyton Barnes. Peyton Barnes and Jody Vaughan are both “second-generation” volunteers. 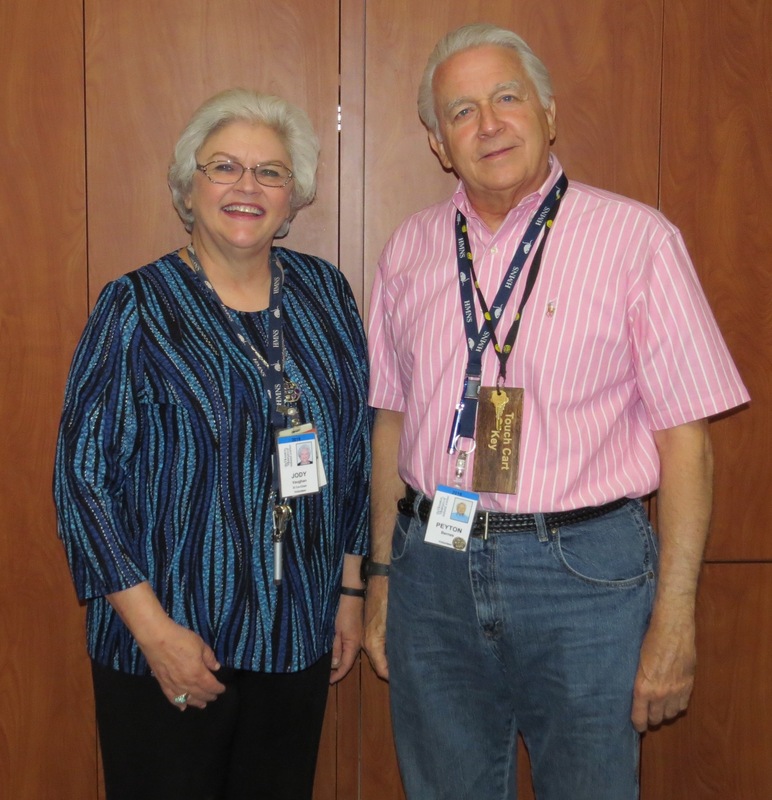 Peyton, a retired surgeon, only became a volunteer three years ago — but his mother, Mrs. J. Peyton (Gertrude) Barnes, Sr., preceded him and served as Guild President in 1971-1972. Jody’s mother, JoLene Whitehurst, was an HMNS volunteer in the 1970s. An RN, she worked in the museum’s health and biology area, which featured a giant mouth and toothbrush, a life-sized transparent plastic body named Tammy, and models of human development from zygote to newborn. HMNS was an important part of Jody’s childhood — her Mom even gave her a museum membership as a wedding gift! Jody is honored to follow in her mother’s footsteps as an HMNS docent and fondly recalls bringing her Mom back to the museum after becoming a docent herself. So why don’t you yourself make some lasting memories, share some quality family time, or simply join the fun by becoming a volunteer at HMNS? You can join us, too! No advanced degrees required, and prior scientific knowledge isn’t necessary — just interest and enthusiasm. Information on volunteering is available on the museum’s website. Consider giving your body to science, and maybe we’ll see you in the halls! I love these stories of the volunteers, from different walks of life, so willing to give of their time and knowledge for the education of the visitors to the museum. Thank you!